The demand within the global market for confectionery ingredients has been rising on account of the popularity of speciality cookies and sweets, finds Transparency Market Research (TMR). The competition in the global confectionery ingredients market has intensified in recent times, and the vendors are introducing new strategies for growth. The direct relation of the confectionery ingredients market to the food industry has affected the competitive landscape. The leading vendors in the global market for confectionery ingredients are projected to gain from the growing valuation of food industry. However, the smaller vendors solely rely on their local markets to earn sustainable revenues in the market. The strategic growth of the leading vendors in the global confectionery ingredients market is reflective of the monopoly of these vendors. The demand for confectioneries comes from various longitudes such as food processing units, restaurants, and household units, and the leading vendors have infiltrated into these consumer segments. The smaller vendors in the global confectionery ingredients market are projected to form collective alliances in order to sustain in the market. There is heavy reliance of the small vendors on local confectioneries and sweets’ shops. Some of the key vendors in the global confectionery ingredients market are E. I. Du Pont De Nemours and Co., Ingredion Inand c., Archer Daniels Midland Co., Barry Callebaut. The global market for confectionery ingredients is expected to expand at a sluggish CAGR of 4.20% over the period between 2017 and 2025. Furthermore, the cumulative value of the global confectionery ingredients market is expected to touch a value of US$109.48 bn by 2025-end, rising up from a valuation of US$76.25 bn in 2016. On the basis of geography, the market for confectionery ingredients in North America is expected to expand at a starry rate due to popularity of speciality foods. The demand within the global market for confectionery ingredients has been rising at a stellar pace in recent times. Several trends related to the food and beverages industry are responsible for the growth of this market. Bakery products are in great popularity across the globe, and this factor has played a crucial role in propelling market demand. Moreover, the increasing popularity of pancakes, doughnuts, and chocolate cookies has also brought in voluminous revenues into the global confectionery ingredients market. New food products are continually being introduced on the shelves of confectionaries, departmental stores, and bakeries. This factor has also given an impetus to the growth of the global confectionery ingredients market. As people become increasingly inclined towards fitter and healthier lifestyles, the demand for low-calorie foods is projected to escalate. This trend could hamper the growth of the global confectionery ingredients market. However, the demand for sugar, chocolate, and cocoa in households and restaurants is expected to keep rising in the forthcoming years. Besides this, the increasing number of sugar confectioneries across the world shall also play to the advantage of the global confectionery ingredients market. 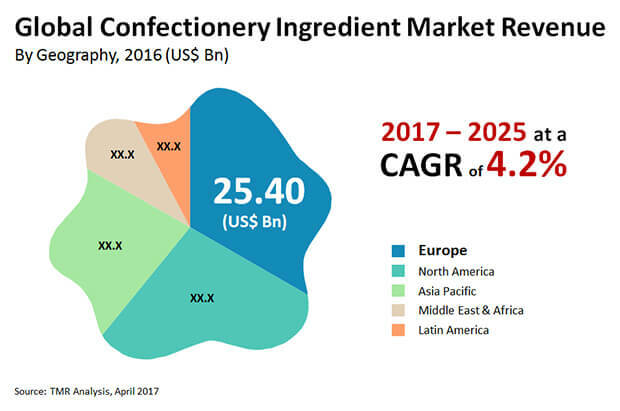 Hence, it is safe to prognosticate that the global confectionery ingredients market would accumulate voluminous revenues in the years to come. The review is based on TMR’s report titled, “Confectionery Ingredient Market (Type - Chocolate & Cocoa, Sugar, Dairy Ingredient, Emulsifier, and Sweeteners, Form - Dry and Liquid, Application - Chocolate, Sugar Confectionery, and Bakery) - Global Industry Analysis, Size, Share, Growth, Trends and Forecast 2017 – 2025”.